With a convenient location and modern event venues, Sheraton Philadelphia University City Hotel is an ideal destination. Stay between the scenic campuses of University of Pennsylvania and Drexel University, top universities in the nation. Children's Hospital of Philadelphia and the 30th Street Station are also nearby, allowing you to easily access the historic sites of the city. Well-designed hotel rooms and suites offer everything you need for a successful visit. Enjoy vibrant views and all of your favorite cable shows from plush beds during downtime. Those seeking to stay active will appreciate our 24-hour fitness center and an outdoor pool with a sun deck. Guests can savor delectable Asian cuisine at Sang Kee Noodle House, located right on site. Groups are invited to gather in one of our elegantly designed event venues, including the Benjamin Franklin Ballroom and William Penn Suite. 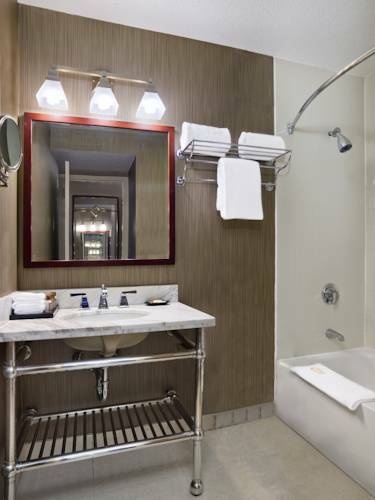 Whether it's work or play that brings you to town, make Sheraton Philadelphia University City Hotel your home base. Sang Kee Noodle House: Open for breakfast, lunch and dinner, this relaxed Asian restaurant is one of three in the Philadelphia area. Join us at the hotel for a delicious meal after a day of sightseeing or visiting Drexel University and the University of Pennsylvania.